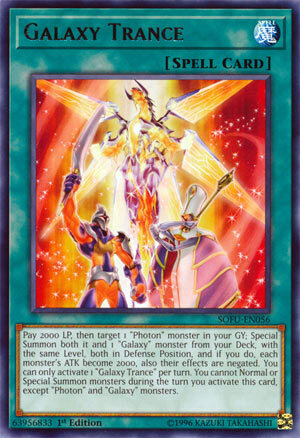 Pay 2000 LP, then target 1 “Photon” monster in your GY: Special Summon both it and 1 “Galaxy” monster from your Deck, with the same Level, both in Defense Position, and if you do, each monster’s ATK becomes 2000, also their effects are negated. You can only activate 1 “Galaxy Trance” per turn. You cannot Normal or Special Summon monsters during the turn you activate this card, except “Photon” and “Galaxy” monsters. Galaxy Trance is an instant Xyz or Link summon for the archetype. 2000 LP is a good cost, it’s ¼ your starting LP, but for the ability to thin the deck by one, Special Summon from the grave, then have two monsters ready to Xyz or Link summon immediately, it’s a smaller version of Soul Charge with a twist. You have to target a Photon monster in your grave, then a Galaxy monster in your deck, which in the late game may prove to be a problem depending on the ratio of monsters from each archetype you keep in your build. Early on though this card is bananas. The lockdown of Special Summoning only Galaxy or Photon monsters that turn is nothing for this archtype, its all they do. The monsters ATK change to 2000, and their levels have to be the same, the level matching also playing a part in making this a potential dead draw late game, but that is all part of balancing this card. Paying 2000LP within the first turn to get an instant Xyz or Link Summon is huge. Titanic Galaxy could hit the board at only the cost of 2000LP, and that leaves you with almost all your resources to further Special Summon and set up your board. This card has to be run in 3’s in the archetype, it is exactly what they needed. Oh, and note this as well…no restriction on playing more than one of Galaxy Trance per turn…that could make things get rough, real quick. Sometimes I love this card, sometimes I hate it. Galaxy Trance is a Normal Spell Card that costs 2000 Life Points and makes it so you can only Normal or Special Summon Photon or Galaxy monsters for the entire turn. Those costs and restrictions are not bad for a 1 card 2 monster play. Your grave needs to have a Photon monster in it to target it, and then Special Summon it and a Galaxy monster from your deck that has the same Level. Both are stuck in def position and have their effects negated and their attack becomes 2000. Since they are stuck in Def, that stat not changing is good. You can get the same monster on the field twice since there is no restriction. Go for any and all Link or XYZ plays with those new monsters. Obviously, this is only once per turn, but a searchable revival card is really good. However, you can’t target any new Photon monsters in your grave that would not have a Level. This sometimes makes Galaxy Zero more appealing. Try it out at 2 and maybe one Galaxy Zero to see which one you end up searching for more. Moving away from the monsters to the newest Spell in the archetype we have Galaxy Trance. Galaxy Trance is a Normal Spell that at the cost of 2000 LP, you can target 1 Photon monster in your GY and Special Summon it and a Galaxy monster from your deck with the same Level, their ATK both becomes 2000, and their effects are negated. You can only activate 1 Galaxy Trance per turn and you cannot Normal or Special Summon monsters except for Galaxy/Photon monsters the turn you activate this card. Great extender for the archetype, likely to get you to an immediate Rank 4, Rank 8, or Link-2. The Rank 8s in this archetype are especially good. The card does lock you into archetypal cards before and after you use it, but that’s fine because you are likely only main decking Galaxy/Photon monsters to summon and the Extra Deck Photon/Galaxy monsters are very strong. The 2000 LP can be very heavy though, but it will be worth it if it resolves. Galaxy Trance is a must for the deck, the card is very strong in getting to your Extra Deck monsters. Art: 4/5 When did their energy go from Blue to Orange? Oh well, they look sorta cool this way. Galaxy Trance is our midweek card, and this is a normal Magic card. This card is certainly screaming for some abuse, isn’t it? And likely will see some. So, paying 2000 Lifepoints lets you target and Special Summon a Photon Monster from your Graveyard, in addition to a Special Summon a Galaxy Monster from your Deck…so long as it has the same Level as your first Monster. Both Monsters are Special Summoned to your Field in defense position, and the attack of each becomes 2000. You are prevented from Special Summoning for the rest of the turn outside of the theme (so Galaxy and Photon only) but that’s appropriate and shouldn’t hurt the player at all, to be honest. They lose their effects also, but you’re Link of XYZ Summoning something off this card anyway, so that’s meaningless too. I like this card, and I do think the 2000 Lifepoints does seem like a bit of a hefty cost (even for two Monsters). But this could and probably will be a game winning play from time to time, or at least one to switch momentum and maybe set up for the win, and that should cost you, so I feel despite being a big cost, 2000 Lifepoints is appropriate. It adds some balance. Art: 4/5 Lots of bright, not blue colors here…maybe the trance has them (us?) seeing different colors? Sometimes it just hurts your head to question Yugioh artwork. Still pretty though.